^ 現代の正書法では If I have seen further it is by standing on the shoulders of giants. ^ Isaac Newton (1959). H. W. Turnball. ed. The Correspondence of Isaac Newton. 1. p. 416. OCLC 460590510. ^ a b c Robert King Merton (1965). On The Shoulders of Giants: A Shandean Postscript. Free Press（英語版）. OCLC 192589. ^ Gunter Gebauer（ドイツ語版） (1995). Mimesis: Culture, Art, Society. University of California Press. pp. 82-85. ISBN 9780520084599. http://books.google.com/books?id=-B8jLLKokSkC&pg=PA83. ^ Édouard Jeauneau (2009). 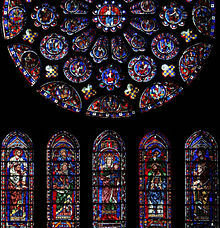 Rethinking the School of Chartres. Claude Paul Desmarais (translation). University of Toronto Press. p. 50. ISBN 9781442600072. http://books.google.com/books?id=qlioj9mAe0cC&pg=PA50. ^ Yĕšaʻyā Ben Malî dî Ṭranî haz-zāqēn (13世紀), תשובות הרי״ד‎ (Tĕšûvôt hā-Rîʺd), OCLC 249158601 . 301-303. ^ David J. Hess (1997). Science Studies: An Advanced Introduction. New York University Press. p. 71. ISBN 0814735649. ^ José Ortega y Gasset (1930). “XII. La barbarie del «especialismo»”. La rebelión de las masas. ^ a b c Jonathan R. Cole（英語版）; Stephen Cole（英語版） (1972-10-27). “The Ortega hypothesis”. Science 178 (4059): 368-375. doi:10.2307/1735508. http://www.jstor.org/stable/1735508. ^ a b M. Oromaner (1985-01-26). “The Ortega hypothesis and influential articles in American sociology”. Scientometrics（英語版） 7 (1): 3-10. doi:10.1007/BF02020136. http://www.akademiai.com/content/LN8627316R60MX12. ^ Lutz Bornmann; Félix de Moya Anegón; Loet Leydesdorff（英語版） (2010-10-13). “Do Scientific Advancements Lean on the Shoulders of Giants? A Bibliometric Investigation of the Ortega Hypothesis”. PLoS ONE 5 (10): e13327. doi:10.1371/journal.pone.0013327. ^ S. A. Goudsmit; John D. McGervey; Robert J. Yaes; Jonathan R. Cole; Stephen Cole (1974-01-11). “Citation Analysis”. Science 183 (4120): 28-33. doi:10.2307/1737230. http://www.jstor.org/stable/1737230. ^ M. H. MacRoberts; Barbara R. MacRoberts (1987-11-01). “Testing the Ortega hypothesis: Facts and artifacts”. Scientometrics 12 (5-6): 293-295. doi:10.1007/BF02016665. ^ Stanley Lai (2000). The Copyright Protection of Computer Software in the United Kingdom. Hart Publishing. p. 69. ISBN 9781841130873. http://books.google.co.jp/books?id=ZpR-CAFuYtgC&pg=PA69&hl=en&sa=X&ei=F08TU7eVAomgkgX37ICwBg&ved=0CDsQ6AEwAg#v=onepage&f=false.